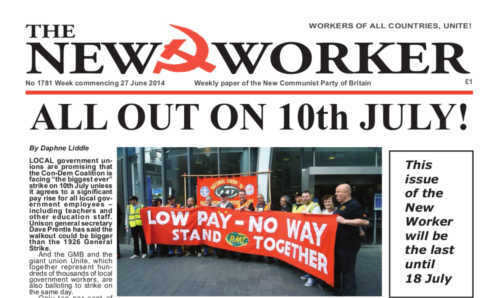 www.newworker.org | 27th June 2014 - All out on 10th July! This is the last issue before the two-week summer break. The next issue will be out on Friday 18th July. All out on 10th July! LOCAL government unions are promising that the Con-Dem Coalition is facing “the biggest ever” strike on 10th July unless it agrees to a significant pay rise for all local government employees — including teachers and other education staff. Unison general secretary Dave Prentis has said the walkout could be bigger than the 1926 General Strike. And the GMB and the giant union Unite, which together represent hundreds of thousands of local government workers, are also balloting to strike on the same day. RUSSIAN peace efforts continued this week with a call for an extension of the ceasefire and the start of serious negotiations between the Kiev junta and the anti-fascist forces who are in control of eastern Ukraine. Last week the Kremlin welcomed the call from Ukraine’s new president, Petro Poroshenko, for a seven-day ceasefire, which was acceptedby the self-defence forces on Monday. But any hopes that this would speed the peace process were soon dashed when the fascist militias violated the truce by launching new attacks in the Donetsk region, provoking a new round of fighting in which a Ukrainian army helicopter was shot down by anti-fascist units. LABOUR leader Ed Miliband is taking a battering from both left and right. The right-wing of the party, led by Mandelson, is behind press leaks indicating a total lack of confidence in Ed Miliband. Mandelson has also criticised Miliband for “making too many crowd-pleasing promises” — like promising to abolish the hated bedroom tax and to curb the profiteering of energy companies. In other words working class-friendly policies. It is hard to understand why Mandelson thinks that “crowd pleasing” is likely to lose Labour the coming election unless he is admitting that the outcome of elections in this country is determined not by the electorate but by the capitalist-dominated media.